Canard & Co, is an extraordinary old fashioned little house right near Ecole Militaire, that offers South-West chic and deluxe earthy products of ever sort. 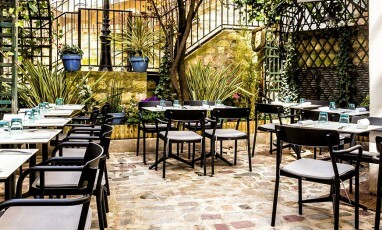 We adore : their set of tables like a darling « easy-going »cantina, duck confit, fois gras or a plate of smoked salmon, tarama, fish eggs, cod with mashed potatoes and great corn bread. Devilish desserts. The must ? Take of a dinner with the gals to do your food shopping : fab bean cassoulets (6,90€), tip top small foie gras cans to be shared at happy hour (15,20€) all from Maison Biraben, the Rolls-Royce of products from the South-West. What else ? Incredible sardine!